On a sunny weekend in April, Jacob and I headed down to Busan for the weekend. 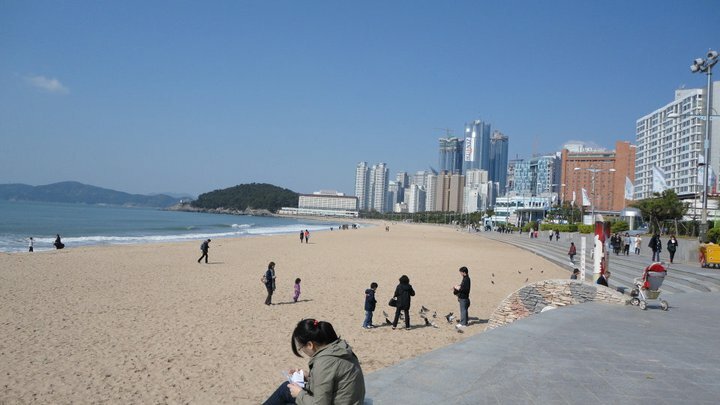 Busan is known as Korea’s “Miami” because there are some lovely beaches. As far as I know, there isn’t a lot of cocaine like the real Miami. Friday evening we raced down to Seoul Station from my work to make the 5:50 KTX. I finished work at 4:40, but sneaked out early and caught a 4:30something subway there. The ride to Seoul Station would take 50 minutes, plus an approximately 10 minute walk to the KTX station. We also needed to get our tickets, as we only had an internet reservation. So in total, that takes at least 70 minutes, and we had about 80. We were just a bit rushed. I was only a BIT cranky due to this, but with some speedy footwork (literally RUNNING through the subway station and to the KTX station) and made it on the train with 10 minutes to spare. Note to self, give yourself at least 1.5 hours before heading to the KTX! Oh, also here’s some info on the KTX. Pretty cool stuff. The ride to Busan was really nice. Jacob had packed us some food for the ride (2+ hours) and we watched Dawson’s Creek on my laptop. We arrived at Busan station around 8:30 pm or so and made the subway ride trek to Haeundae station, which is where our love motel was. Oh yes, did I mention we stayed in a lovely love motel called Santa Fe Motel? We did. 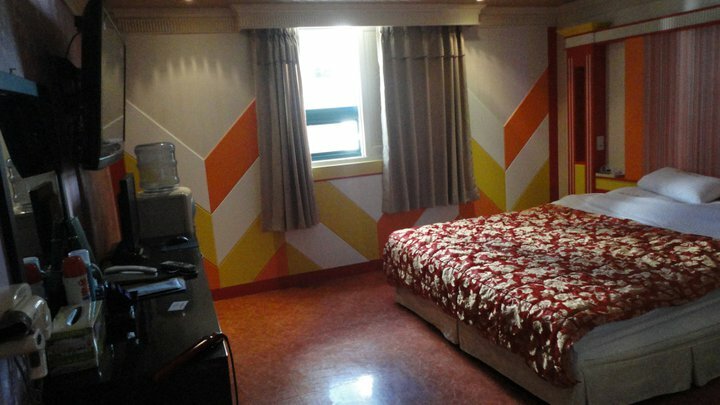 Love motels are great, really, but they sound kind of strange and/or gross. They are cheap (around $40 a night) and come with lots of little freebies. However, here’s the story. In Korea people usually live at home until they get married. This means that there isn’t a lot of uh…private time for young couples. So they will often stay in love motels for the night (or a few hours). Of course, lots of sleazier people stay in them too, but tonnes of frugal tourists use them all over the country. 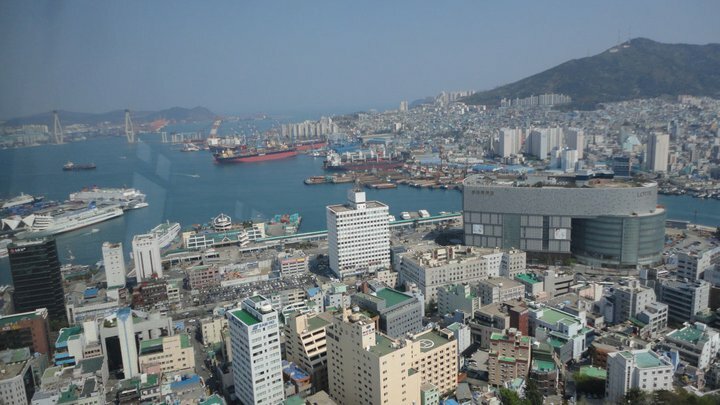 The one we stayed at was cheap, clean, nice, quiet, and about 4 minutes from Haeundae station. We stayed in that night, but woke up bright and early (8:30!) on Saturday morning. I was desperate to find somewhere to eat a western style breakfast, so after some quick Googling we headed down towards the beach to a restaurant that claimed to serve just that. It wasn’t open until 10 am so we walked along the beach and had some coffee. It was beautiful. 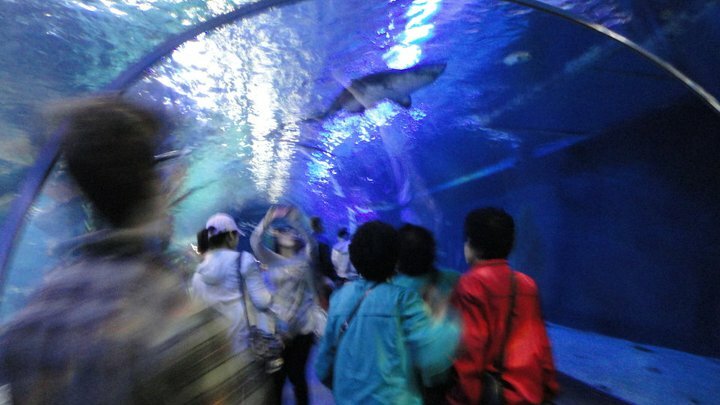 After a satisfying breakfast at Breeze Burn’s, we decided to go to the Busan Aquarium. It was pricey compared to the regular price for attractions in Korea (usually around $4) as it was about $15, but worth it for sure. It was quite large and had TONNES of fish. The coolest part was the tanks that you arched over the walkway, so the fish were surrounding you. There was also an opportunity for a shark dive (eep) that Jacob tried to persuade me to do (I’m not sure he was even convinced) but we left that out. A blurry photo of the massive tanks. After that we wandered around to the APEC house. 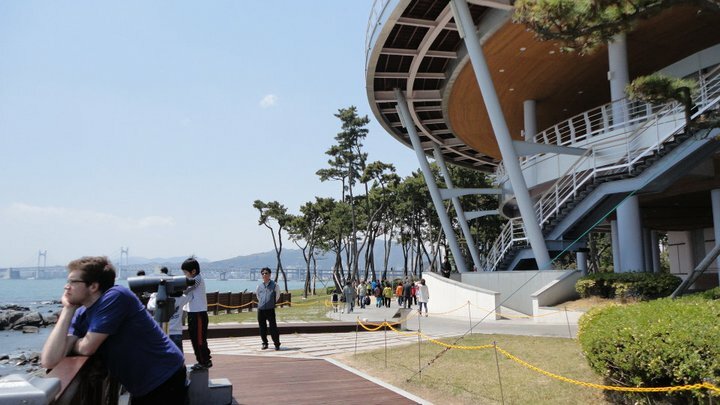 It’s the house built for the 2005 Asia-Pacific Economic Cooperation which was hosted in Busan. Jacob put it best when he said they built a house for a luncheon. Anyway, the house was beautiful and on a great plot of land. We walked up a winding path surrounded by trees and flowers and wandered up to the house which was on the water. It was free to wander around there and was pretty cool to see. Jacob and the APEC house. After lunch we headed to the Busan Art Gallery. It WOULD have been nice, but instead was pretty unpleasant due to a children’s event which was being held there. Basically there were people screaming in Korean over a mic and dozens of children shouting non-stop. This was all reverberating off the marble walls of the building. Just what I like to hear when I’m perusing art. In the evening, after some deliberation, we made the decision to head to Ulsan to meet Jacob’s friend Laura who has lived there for a couple of years. We took the Saemaul train there and in an hour arrived in the small (2 million people) town of Ulsan. 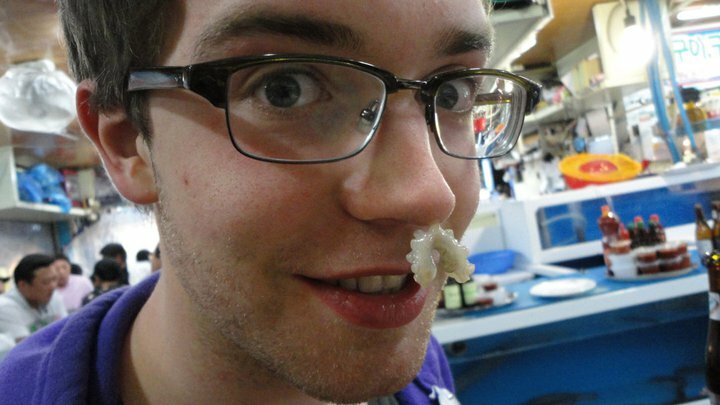 Laura met us at the train station and we headed to a fish market to eat some sashimi andddd sannakji. What’s that you say? Live octopus. Yes. We ate it. I have a video to prove it. It's sticking because it's "alive." The octopus was (unfortunately) cut up while it was alive and then it’s served to us on a plate, wriggling, with a sesame oil sauce. Ours stayed moving for a good hour. It really tasted like nothing, but was tough to chew. You have to chew pretty hard to make sure it’s done wriggling, or else it can potentially stick to your esophagus, and that’s a bad thing. After we finished up our deliciously fresh meal we headed to a makgeolli (rice wine) bar and then headed home pretty late. It was a great time and Jacob’s friend was a lovely host. The next morning we headed to OPS Bakery, which looked and smelled as close to a real bakery as I’d found. 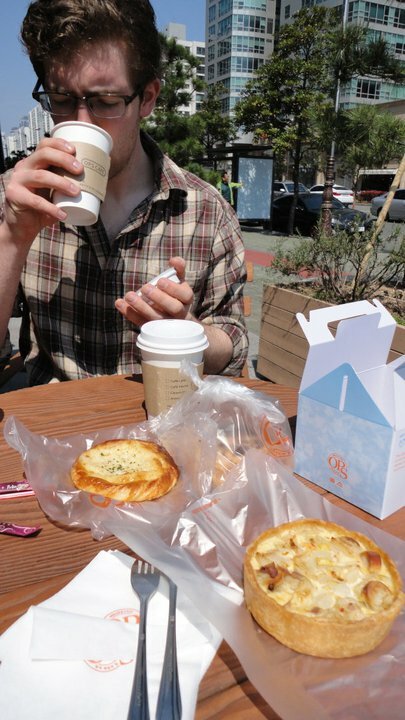 We ate some fresh baked goods and coffee and almost forgot where we were. That's my coffee he's drinking. 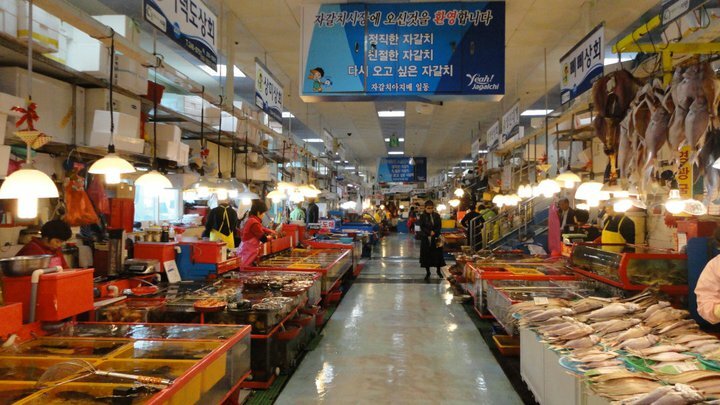 We decided to head back to Busan station for the rest of the day and our first stop was the Noryangjin Fish market. It was a massive complex full of writhing, live fish, octopus, small sharks, snails, clams, etc. etc. We wandered around but since we’d had our fill of fresh fish the night before we didn’t partake in the possible feast, but it was still interesting to see. We were leaving that afternoon so we didn’t have a lot of time. We headed up to Busan Tower to finish up the afternoon and have a view of the city. It was a nice walk up a path and we paid the entrance fee to get some great pictures. We decided to take the bus back because it was cheaper and we weren’t in a rush, so we took the hour long subway ride to the bus terminal. We were actually early this time, so we wanted something to eat. Unfortunately, all that was available was Lotteria, which is a Korean fast food chain that I happen to dislike. I’d promised Jacob we’d go there eventually, as it’s too gross to pass up, so we did. I had a (not terrible) shrimp burger but he had this nasty Hanoo Burger which made me feel sick to just look at (although he claims it wasn’t bad. We were then ready for our five hour bus ride home. We spent that time sleeping and watching…Dawson’s Creek. Overall, a lovely and refreshing weekend.